When I’d finished watching the pilot episode of A&E’s Bates Motel, I was at a loss as to how to take what had been shown so far. Here we have a series that takes the story most of us know, that of Norman Bates and his mother Norma who both put a whole new meaning to the term ‘momma’s boy in the classic Alfred Hitchcock film ‘Psycho’, and puts it into a modern setting. But there’s a little more to the story than that and what Bates Motel seems to be is the ultimate what-if experiment. Take a classic story change the setting and add a few more variables plus do it at a more formative age for the famed antagonist then step back to see what happens. From the first few moments it’s clear that there’s a dark secret already lurking in the Bates family when a sudden death leads mother and son to pack up and move to the seemingly quiet small town of White Pine Bay. A place where everyone knows everyone and naturally their business as well. Norman doesn’t start off as anything more sinister than an introverted but curious teenager who’s apparently dealt with his mother’s whims and moods for years now. She leans on him in a way that causes a devastating guilt trip every time that Norman wants to break away from her and establish himself outside of his role as supportive son. Somehow inexplicably the second the cute popular girls see Norman waiting for the bus they immediately connect with him. About the same way you would with a cute puppy that was found outside more than a person that should be dealt with very delicately in a social climate. There’s also a very interesting underlying sexuality in this show. It seems as though every single teenage girl or older woman--mother included--has this strange chemistry with Norman. At first it’s easy to pass it off as something imagined but when his new teacher keeps him after class to speak with Norman there’s just that odd nearly predatory feeling of someone who is definitely in her young student’s personal space. Well-meaning perhaps but viewing how his own mother is with him--she relates more often with him like he’s her husband not her son-- it wouldn’t be out of the realm of possibility that the ladies love Norman Bates or at least that’s how we’re supposed to see it. Even though he’s seemingly been accepted at his new school you can still almost feel a kind of burgeoning Carrie vibe brewing. So far so good though on that front as the only thing that happens with Norman so far is he feels out of place at a wild party he gets dragged to. However there is a consequence for this event as he snuck away from Norma to do it. It’s as if to spite the hopeful notion of this what-if story experiment that the second Norman does something on his own that Norma should pay for it—dearly. This dark act leads to Norma and Norman bonding in a very unconventional way but it also brings us to the idea that the place they moved may turn out to be even shadier than our lead characters that have stood over not one but two bodies already in the first episode. That’s where Bates Motel truly gets interesting as the story possibilities are wide open beyond just waiting for a once inevitable ending to occur. Both Norman and Norma are not to be messed with and their outsider status in the town is going to give us a great way to unlock the secret dark goings-on lurking in the creepy cellar we glimpsed at the end of the episode. 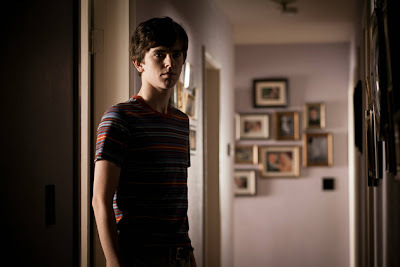 Could this version of Norman Bates wind up using his inner darkness to save lives instead of take them? I couldn’t be the only person that could see a sort of young Dexter Morgan possibility from this show. Will he become the psycho killer we all know or something a little bit different? One thing that makes this show so intriguing is how it’s set up where it’s just as possible for Norma to have been responsible for the first body as it could be for Norman to have committed the act. One thing’s certain after seeing the pilot, Vera Farmiga is fierce and unsettling in her role as Norma Bates. She’s got this femme fatale vibe to her that makes her so interesting to watch. Especially when she seems to know about her son’s possible darkness and has no problem invoking it when she’s in peril. That’s a very special sort of motherly love. Freddie Highmore shows glimmers of what Anthony Perkins brought when he originated the role but the hour belonged mostly to Norma. So we’ll have to see what else he’s called on to do as the series goes on. It’s no easy task to take on such an iconic role but Highmore has shown a great deal of talent over the years so he might just have the chops to pull it off and make the role his own over time. I can’t wait to see how this small-town mystery unfolds on Bates Motel and how the series chooses to use it to build Norman Bates. So many secrets already in just one episode and we’ll have to wait and see how many come to the surface…much like how a body that’s been dumped into a lake always seems to find its way back to the shore.